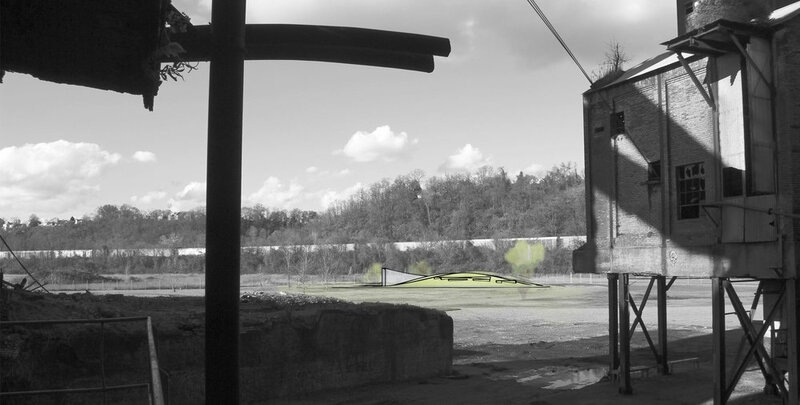 Environment Design, Design Research, User Experience • How do three designed places of respite within Pittsburgh's last standing blast furnace help visitors experience the scale of the environment? The Carrie Furnaces are a pair of abandoned blast furnaces on the Monongahela River, immediately southeast of Pittsburgh, Pennsylvania. For the last half-century, the structure has been exposed to the elements, and now exists as a relic of the Steel City's history. In a team of six, I spent a semester working with the Rivers of Steel Heritage Group, the property's caretakers, to reimagine the iconic location as an educational park. Spending an extended period of time handling a historical site afforded my team the opportunity to explore deep into research, which in turn informed the restraint and attention to detail which drove our final design. 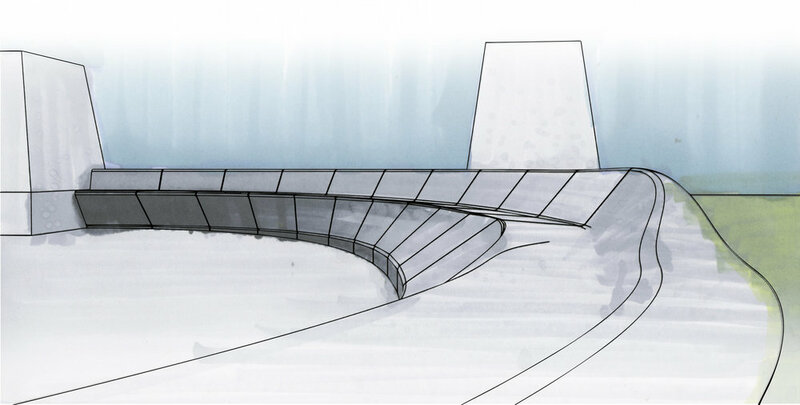 The drawings above are renderings of designated exhale spaces, moments of subtle modification to the park that encourage reflection and frame the magnitude of Carrie. We started the semester with five weeks of research. We explored Carrie's rich history, from labor strikes to environmental impact. Our goal was to amass enough contextual knowledge that we had the merit to make modifications to the historic site. Each of the six of us made several 11x17 boards, each representing a story. Together, the 40 or 50 stories we collected formed larger overarching narratives which we could tell in our educational park. During this first phase, we also experimented with simple exhibit modifications to the Carrie Furnaces space as a jumping off point for future iterations. 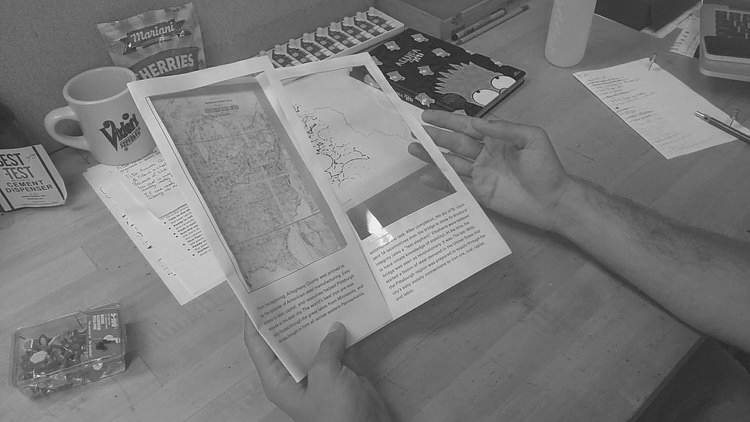 The three simple prototypes below are iterations on a basic pamphlet design, which modifies the space by altering the participant's frame of mind upon entering the park. The simple artifacts below give context for the experience of visiting Carrie, as well as Carrie's context within the larger American steel industry. The next part was a rapid two week synthesis of the themes we realized over the six. We spent the first week of this segment in teams of two, building three separate presentations that conceived narratives from our collectively compiled database. Our three thesis statements then amalgamated into one from which we would design a single master plan. We found that to make modifications to Carrie Furnaces, we would need to act with restraint, respect, and attention to detail. 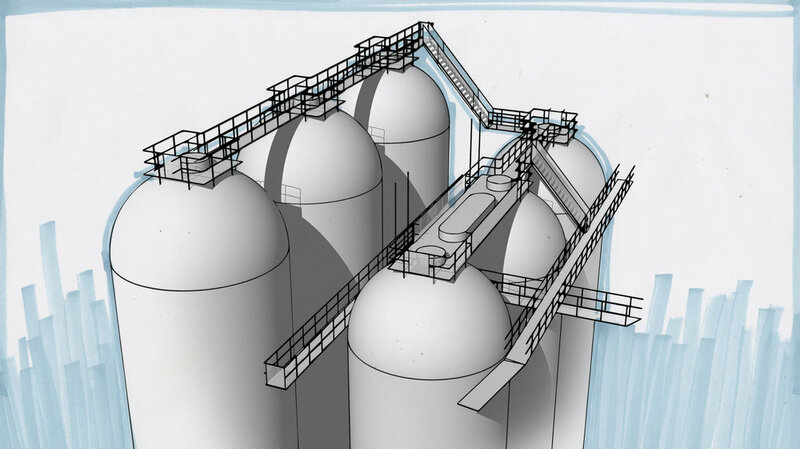 We divided up our master plan into six projects in order to have more opportunity for individually resolving details. The exhale spaces, a series of three curated settings throughout the site, provide respite and opportunity for reflection. Marked by careful and deliberate modifications to the space, these locations afford a more profound appreciation of Carrie Furnaces by encouraging reflection. 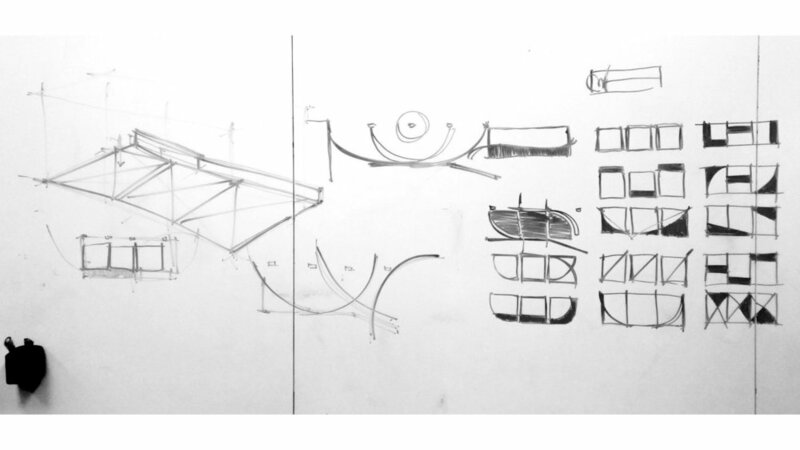 After two months of whiteboard drawings and Rhino models, I finished the semester with three cohesive forms that could be embedded within the space and accommodate appropriate behavior from visitors. These three locations encourage stopping to rest in order to better experience the real treasure, Carrie itself. They influence how visitors flow throughout the space, effecting speed, sound, mood, and most importantly sense of discovery. The way of looking defines each of the three spaces, and a unique seating system encourages that specific experience for each location. 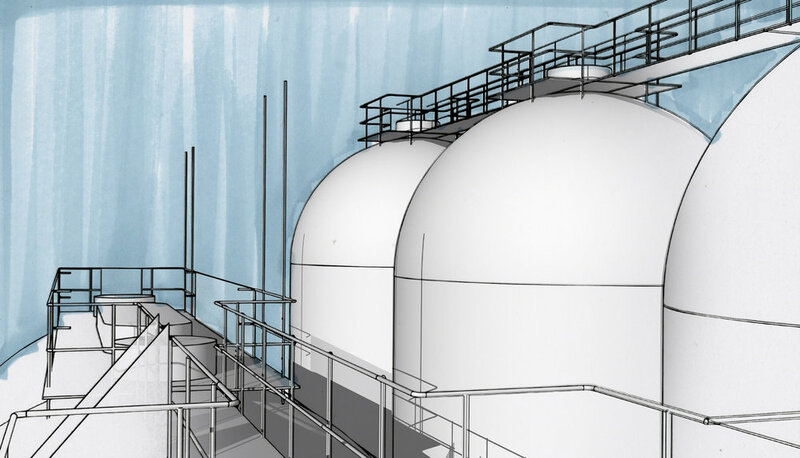 The first location is underneath the pipes in the belly of the structure. The small enclave on the ground level is tucked into the cobweb of pillars and pipes. This space will be cozy and inviting, while at the same time framing the overwhelming magnitude of the engineering feat. Here visitors will look up on the swept, extended bench that transitions from a traditional seating angle to a reclined one. The entire space will be a single concrete form, challenging conventional schema associations and encouraging the same exploration as the steel ruin. 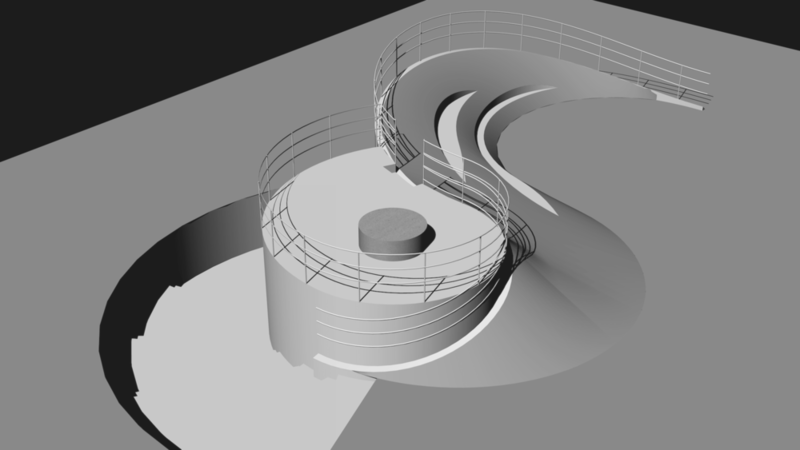 The second location will be on the catwalks above the six Cowper stoves. Modifications to this space accentuate its features with minor inclusions of rotationally symmetrical benches that encourage solitary viewing of the staggering panorama. Because the spot is so high up, safety and perceived security are integral issues to manage; reinforced floors and railings will add an improved sense of security. The third space acts as an overview location from which to view the entire park. Being at the opposite end from the entry point museum, viewers will experience this spot after Carrie itself, making it a place for true relaxation after a period of intense attention. The field framed by Spot 3’s concave earth berm will naturally become a place for picnics, reading, and other typical park activities. Thank you to Jasper Tom, Ji Tae Kim, Chris Perry, Ty Van de Zande, and Gilly Johnson for being a wonderful team on this project.